Rago’s passion for coral would prove indispensable in his effort to document its destruction. Oceans have already reached levels of warming that threaten the survival of the coral. Coral responds to a temperature fluctuation of even 2 degrees Celsius by expelling the algae grown within their body tissues, losing their characteristic resplendent colors. The coral skeleton turns ghostly white, a sign that the coral animal is on the verge of death. Once an uncommon occurrence, the number of bleaching events has spiked in the past 30 years as oceans have continued to warm. Determined to share the scope and significance of this underwater climate tragedy with the world, the coral team plans to record bleaching events around the world. Rago, is devoted to his task. He was raised in the Rocky Mountains of Colorado, at a great physical and cultural distance from the oceans where coral lives. He nevertheless developed an obsession with the majestic beauty of coral animals, even keeping a tank of coral in his home. Inspired by another documentary team photographing the disappearance of glaciers, the coral team designs an elaborate underwater-camera system complete with wireless connectivity and self-cleaning capabilities. But their first attempts to capture bleaching events in Hawaii, Bermuda and the Bahamas go awry when the time-lapse photos come out blurry. Disappointed but determined, they trace evidence of rising ocean temperatures to chase coral bleaching events across the globe. The process of manually photographing the coral is physically grueling, requiring them to spend four hours a day underwater for several weeks. Worse than the physical strain is the emotional toll the work takes on the team. Even with his enduring affection for coral, Rago was not emotionally prepared to watch the slow death of this living creature. Emerging from one of his dives, he avoids eye contact with the camera as he reports his observation of the coral’s rapid tissue necrosis, or R.T.N. Tears well up in his eyes. He looks like someone who just lost a loved one. Rago and the coral team are witnesses to the devastating effects of global climate change. They give themselves over to a passionate defense of the ecologically vulnerable reef. 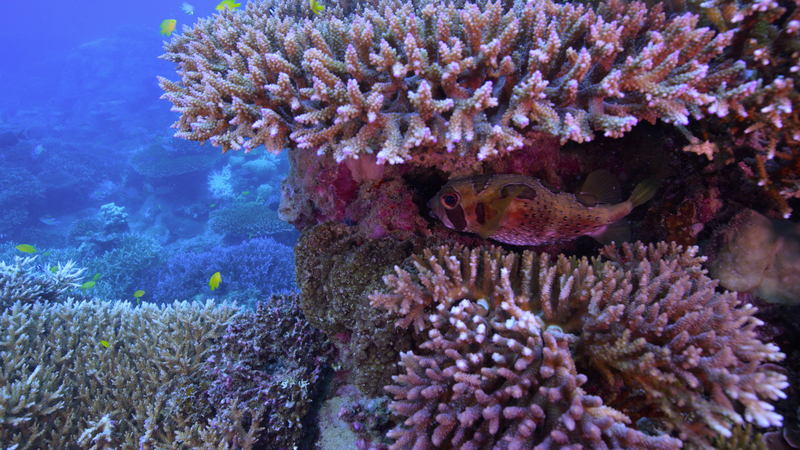 They keep vigil at the coral’s side as swaths of it pass away. Rago shares that he had initially planned to document the event “without emotion,” but in the face of the devastation of the beloved coral, emotion burst the restraints of indifferent objectivity. In “Laudato Si’,” Pope Francis decries the “globalization of indifference,” calling upon Catholics to envision ourselves as one human family. He draws on the words of St. Francis of Assisi and St. Bonaventure to expand the scope of family to include every living creature. It is in these relationships that we realize that the fate of other creatures is linked to the fate of the human family, and our personal fate as well. Like Rago and the coral team, we are creaturely siblings to the coral, made aware of their vulnerabilities and witnesses to their suffering. It is in our witnessing that we come to understand our right relationship to the entire created order. The passion for coral at the heart of this documentary calls for new awareness of the devastating, and often unseen, effects of climate change. The debate among U.S. Catholics often concerns whether or not climate change is real; meanwhile, climate scientists are working to see whether its implications will be simply terrible or truly catastrophic. Saving the reef from certain destruction necessitates an acknowledgment of a dire climate situation that threatens all created life. Having done the physically difficult and emotionally devastating work of documenting the crisis, the coral team has set out to share their findings with the rest of the world. They are on a mission to make witnesses to the coral crisis, hoping that the rest of us will come to see the beauty beneath the waves and act passionately to save it. This article also appeared in print, under the headline "Netflix's "Chasing Coral" documents an unseen environmental disaster," in the September 18, 2017 issue. Nichole M. Flores is an assistant professor of religious studies at the University of Virginia, Charlottesville, Va.